It’s that time of the week again — the Fortnite season eight, week four challenges have arrived for players around the world. Much like the mediocre challenges from last week, this week’s are also pretty tame. At the very least, there are some challenges that highlight season eight’s themes of pirates and treasure. While the challenges aren’t that great this week, they do offer some great rewards for players. As usual, there are a total of seven new challenges to take on during this fourth week of season eight. Of those seven challenges, there are three that are available to free players and four that are exclusive to Battle Pass owners. It is likely, though, that you already own the Battle Pass for this season if you did the overtime challenges last season. You can find the full list of the week four challenges in our screenshot above. The bulk of the more exciting challenges are exclusive to the Battle Pass owners. By far, the most interesting and difficult, though, is the search for buried treasure challenge. 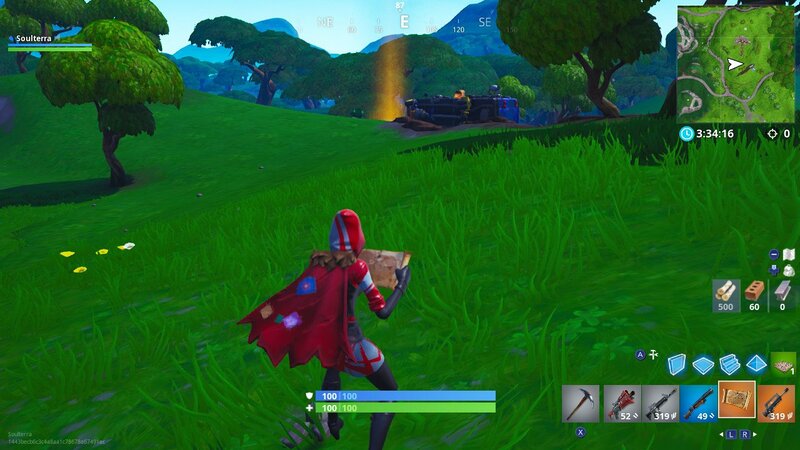 Players will need to utilize the new treasure map item that was added shortly after the launch of season eight. After all, a pirate-themed season wouldn’t be complete without some awesome buried treasure chests to discover on the map. The challenge is simple: ‘search for two Fortnite buried treasure’. Well, you will first need to find the buried treasure map in order to complete this challenge. That alone can make it a bit hard to do since you will need to rely on some luck in order to find this elusive item. Lastly, you will actually have to find it twice in total to complete this challenge. Before you can do anything else, you’re going to need to find the buried treasure map. It looks just as you would expect a treasure map to look. 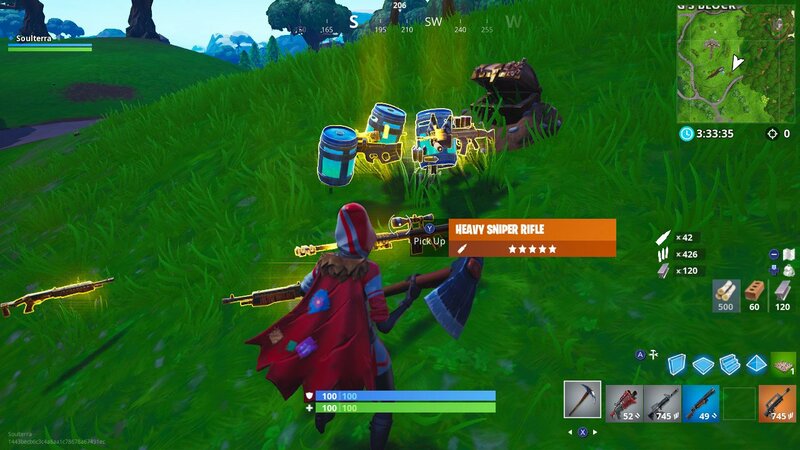 Similar to other loot items in Battle Royale, you will need to pick it up and it will take up a slot of your inventory. That means you should leave a spot open for the buried treasure map or be willing to switch something out for it. Be warned, that luck does play a factor in obtaining the treasure maps as there aren’t any specific locations that you can look to find them. 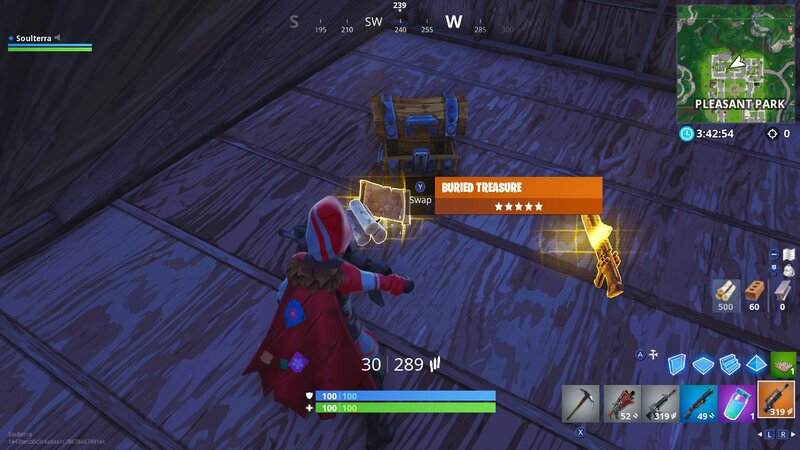 They can spawn on the floor just like normal loot in houses and buildings, and can also be found in chests. This means it can take a couple of tries or matches to find one. 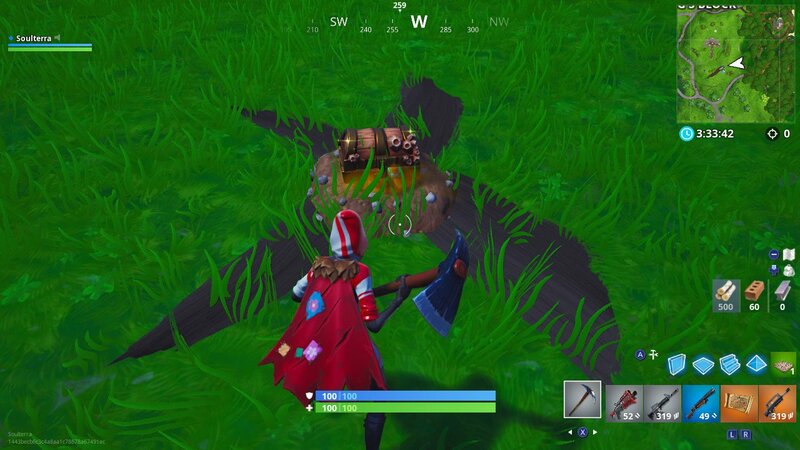 We recommend completing the Search Buried Treasure challenge in the Team Rumble mode as it will give you the most amount of teammates to play with and the least amount of enemies to fight. Additionally, having respawns is great since you won’t have to worry about restarting a new match. Don’t forget about turning on the Party Assist feature so if your teammates find one of the treasure maps, it will count for you as well. Head to areas that aren’t very popular like Snobby Shores, Haunted Hills, Junk Junction, and Lucky Landing, just to name a few. Also check unnamed locations like the new hot springs, expedition camps, and the abandoned mansion. These unpopular locations provide you with more time and opportunities to find these items. For reference, it took us searching the entirety of Pleasant Park to find one. Just having the item in your possession won’t allow you to complete this challenge. Once it is in your inventory, switch over to the treasure map item so it’s in your hands. You will be vulnerable while doing this since you will have to switch over to your weapon if you encounter an enemy, hence why Team Rumble is important for this challenge more than most. However, just holding the item in your hands isn’t going to lead you to the treasure reliably. You can see the glow of the treasure but this can take you time to find. Once you have the item in your hands, you are going to want to use it just like any other item in your inventory by pressing the trigger, button, or whatever input you normally use on your platform of choice. This will create a nice little red dotted line in front of you as seen in our screenshot. This red dotted line will, of course, lead you directly to the buried treasure itself. So, you are going to want to continuously use the item so it shows you where to go. Oddly enough, we encountered an issue doing this where the line didn’t go on as far as it’s supposed to. If this happens to you, you may have to solely look in the sky for the golden glow of the treasure and go towards that. Just be careful to watch out for enemies as you do this. Thankfully, the game is mostly good about not setting buried treasure too far away from where you initially find the map item itself. Once you finally arrive at the designated location, you will notice something on the ground. There is an “X” to mark the spot, just like you’ve probably seen in many classic pirate adventures. Interestingly enough, you may notice that there is no option to interact with the X and find the treasure. Instead, you are going to have to literally dig up the treasure yourself. 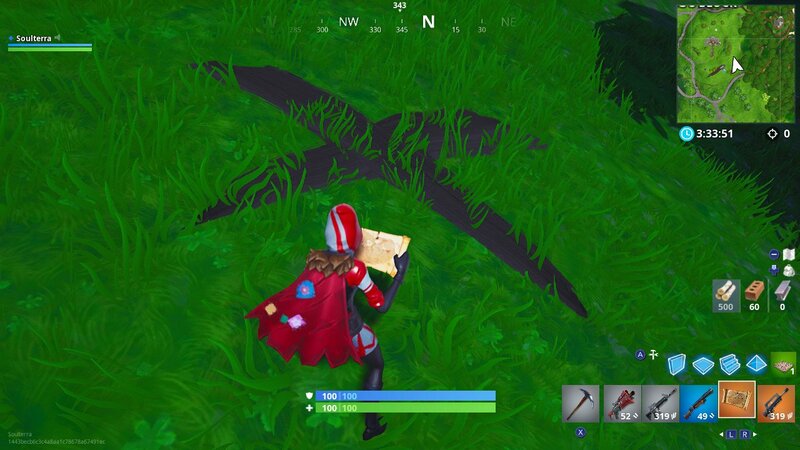 So, pull out your trusty pickaxe and start mashing away on the ground where the X is located. Keep this up for a few seconds and you will see the treasure chest gradually come up out of the ground. Congratulations, you just found yourself some buried treasure! You will notice that this chest is much heftier and fancier than your average treasure chest in Fortnite. That isn’t just for show. This chest is a much beefier version of your run of the mill treasure chest. It takes much longer to open and for a good reason. Just take a look at all of the loot that we found below from a single buried treasure item. There are golden legendary items literally everywhere, more than enough for you and your friends. This is a great way to gear up and prepare to massacre your enemies in Team Rumble. Unfortunately, the challenge isn’t over just yet. Because you actually need to find one more buried treasure chest in order to complete this season eight, week four challenge. All you need to do is repeat the steps you did for the first one. For finding the buried treasure in this challenge, you don’t just get a ton of legendary gear but some battle stars as well. 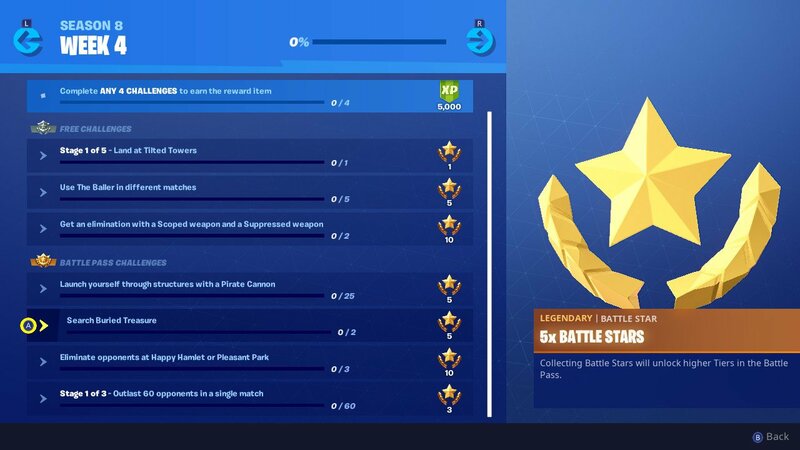 You get five battle stars for completing this season eight, week four challenge, which like always, is enough to guarantee at least half a tier level up for your season pass.